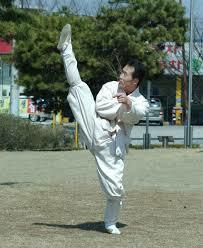 Taekkyon kicks are similar, yet different to those of Taekwondo, Hapkido, and other martial arts. 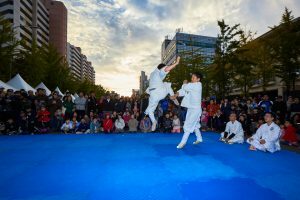 Even though some kicks that originated in Taekkyon were adopted by Taekwondo and Hapkido, they do not seem to be performed the same way as they are in Taekkyon. In some instances the stances are different, as are the mechanics of the kicks. Taekkyon kicks do not often look pretty nor appealing, however they are quite effective. 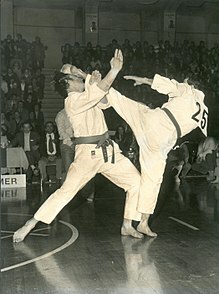 One example of a few differences between kicks, is if one were to stand very close to an opponent, (within arms reach), should a Taekwondo practitioner perform a kick, it will be different to that of a Taekkyon practitioner performing the same kick. The Taekwondo kick would be more powerful but slightly slower. And as their supporting foot would be facing away from thier opponent, they would be easily prone to being thrown, tripped, or pushed as their footing is weak. And more so if they are raised on the ball of the foot. The Taekkyon kick would be a little faster but less powerful. And as their supporting foot would be positioned differently, they would be much more stable. Their foot would be at a good angle relative to their opponent, and not on the ball of their foot. Thus they are less prone to being tripped or pushed. Also, as the taekkyon kicker’s body would be upright whilst kicking, they are ready to engage in wrestling, being grabbed and so on. 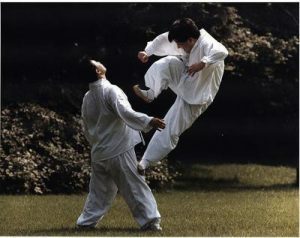 Within Taekkyon there are kicks used during a competition, and there are martial kicks to be performed during a fight. 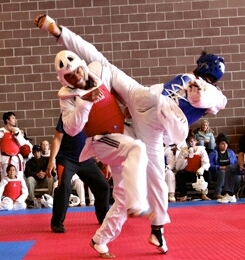 The kicks performed during a competition do hurt, but they are not meant to damage the opponent seriously. 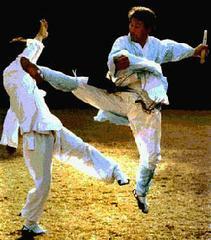 Kicks performed during a fight are martial kicks, and thus are designed to result in serious damage. When the Taekkyon practitioner kicks, internal movement is developed within their body. This is developed over time from the stepping technique (seen on page one). When practicing the stepping technique, the whole body moves. When kicking, the whole body moves rather than just moving the kicking leg, turning the supporting foot, arms, and head. Power is derived from bending and rising of the supporting leg at the knee, pushing of the hips, and movement of the upper body in relation to the movement of the kicking leg. And these movements are found in the stepping technique. Thus much stepping practice influences one’s kicking technique. Taekkyon kicks are smooth & flowing without having a snapping action. They have a pushing action rather than a whipping action seen in Taekwondo. When kicking, the knee joints are not to be locked. 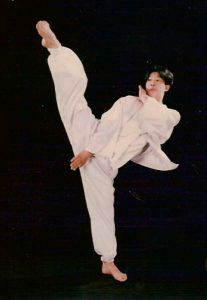 Smoothness, remaining natural, and not bieng stiff are emphasised as the basic tenents of taekkyon kicks and movements. Please refer to Feet / Stance section to learn more about Taekkyon kicks and how they differ to those of Taekwondo.